Police deployed a ‘stinger’ after a teenager drove through a checkpoint, a court has heard. Gareth Doherty, of Moore Walk, pleaded guilty to dangerous driving, having no insurance or licence and failing to stop for police. The 19-year-old also admitted driving a car with a defective exhaust system and a defective light on February 13. 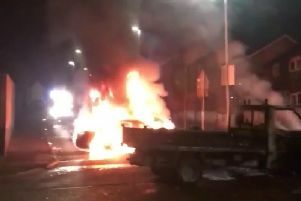 Derry Magistrates Court heard that police received a report Doherty was driving a car up and down Francis Street and was revving the engine. Later the same day officers received a further report of a ‘joyrider’ in the Galliagh area. Police set up a checkpoint in Coshquin area and Doherty approached it. He stopped 30 metres away and an officer waved a light to warn him to stop. The 19-year-old drove through the checkpoint causing the officer to take ‘evasive action’ to avoid being hit by his car. A ‘stinger’ was deployed and the tyres deflated. Doherty was arrested walking away from the car. During police interview, he admitted being in the car but denied being the driver. Defence counsel Stephen Chapman told the court his client has a clear record. He said the offences are ‘out of character’ for the 19-year-old and it is ‘unlikely’ he will be before the court again. Deputy District Judge Oonagh Mullan said the offences were ‘foolish and stupid’. She added Doherty’s behaviour was appalling and on this night ‘you put other people’s lives at risk. The police officer could have been injured and you are very lucky that didn’t happen’. The judge suspended a three month sentence for two years and fined Doherty a total of £350. She also disqualified him from driving for 18 months.